Company integrates haredi techies into start-up world. 'This is the future of the haredi community,' says Kamatech founder. Over 300 potential investors, including some of the most renowned names in the hi-tech world and New York Jewish community, flocked to Kamatech’s “Demo Day”, held at the ADP Innovation Center in Manhattan last week, to get an exclusive sneak peek at eight cutting-edge start-ups. The innovations put on display at the event are all part of Kamatech’s 2017 Accelerator program in Bnei Brak. 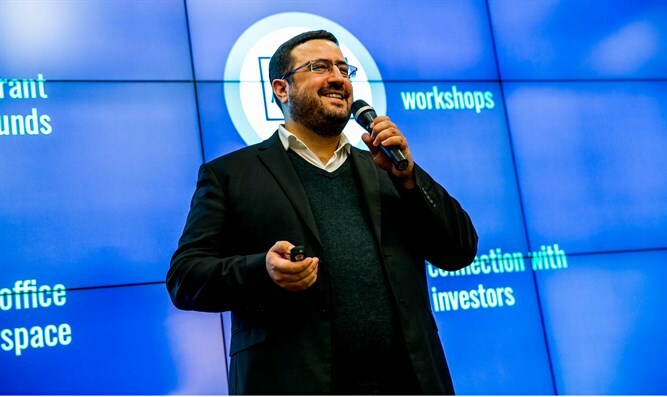 Moshe Friedman, a haredi entrepreneur and founder of Kamatech, has opened doors for haredi entrepreneurs looking to connect to Israel’s start-up world, offering them apprenticeships in top start-up companies and providing supervision by senior experts. When Kamatech was founded in 2013, there were only 5 haredi startup companies. Today, there over 600 haredi-owned start-ups employing thousands of haredi hi-tech specialists. Kamatech has received strong backing from start-up moguls including Dr. Yossi Vardi (Mirabilis), Amnon Shashua (Mobileye), Zika Absuk (Cisco), Adam Neumann (WeWork), as well as community leaders such as Malcolm Hoenlein, Executive Vice-Chairman of the Conference of Presidents of Major American Jewish Organizations and the UJA-Federation of New York. “We are extremely proud and excited about our start-ups because these talented young people represent the future of the haredi community and Israel’s renowned start-up nation innovation on a global scale,” boasted Friedman. Adam Neumann, the CEO of the multi-billion dollar WeWork shared workspace empire, praised Kamatech’s ability to harness the best and the brightest from the yeshiva world. “To take the great brains of youngsters learning in yeshiva and teaching them how to convert their passion and energy for the hi-tech world is a great cause,” Neumann said. During Demo Day each start-up CEO was given three minutes to showcase his or her start-up concept to investors. The innovations ranged the gamut of technological ingenuity including the creation of an AI (Artificial Intelligence) language, Brillianetor, which enables machines to “speak” with each other; a platform for smart urban life management dubbed Doorbill; a ground-breaking musical program called Muze that allowed the late Shimon Peres to play Beethoven’s 9th symphony within minutes; and a cutting-edge application called Emerj that will help corporations retain employees by engaging them in a more personal manner. Friedman also revealed that several of the aforementioned start-ups are already attracting considerable attention from Fortune 500 companies. Hila Glick, the Director of StarTAU, at the Tel Aviv University Entrepreneurship Center claimed that Kamatech and Moshe Friedman are fomenting a business and social revolution within Israeli society. “Kamatech alone is expecting to increase Israel’s GDP by billions of shekels, as thousands of Ultra-Orthodox professionals integrate into the technology sectors,” she said.